We'll start with ShadowGun's most hyped feature: its looks. ShadowGun is the best looking fully-3D-rendered Android game I've seen yet, and we can probably thank some of NVIDIA's driver optimization magic for making that possible. The character textures in particular are miles ahead of anything I've seen previously on Android - at least anything that's this complex to render. While the dank and dark settings of ShadowGun do get a bit repetitive at times, they're a far cry to the environments other Android shooters offer, which are far more reminiscent of GoldenEye than they are Gears of War (the similarities with GoW don't end there). While some of the less detailed objects and textures in the game do look like something out of a PC game from 2005, the more modern character models and lighting easily make up for it. Again, refer to gameplay footage to get a sense of the level of detail - you'll be impressed. On a related note, I experienced no performance issues while playing the game on my Tegra 2 tablet. The game ran perfectly smoothly (albeit capped at what looks like 40 FPS) and things never chugged, even with with 5-7 enemies on-screen. Again, I'll have to give kudos to NVIDIA here most likely - as, in my experience, so many 3D games on Android experience less than consistent performance. We aren't certain at this point if the game will play on devices with different processors, but I imagine performance or graphics will suffer on non-Tegra devices. A note on the sound: it's pretty damn good. While I didn't try it with headphones, sound effects were clear and distinct even out of my tablet's speaker, and the music isn't shabby, either. Voice acting is present, and NVIDIA claims it's pro-quality stuff - I sort of wanted to turn it off. To each of their own, I guess. This is probably the most complex soundtrack assembled for any Android shooter, so ShadowGun is probably setting the bar from here on out. Think Gears of War, but for your phone / tablet. Really. It is pretty much the exact same idea, universe, and plot-line streamlined and simplified into a touch experience. But let's talk about the mechanics first. It's a cover-based 3rd person shooter with a few puzzle elements. You have your gun, you hide behind a large, heavy object, and you shoot at enemies behind large, heavy objects. Little exploding spider robots are thrown in to make things more interesting, along with turrets, flying sentry drones, and land mines. And there are big scary mega-sized bosses. That pretty much covers the types of content I got to see. Aiming is done by using the blank area near the "shoot" button as a joystick, and movement is accomplished by a floating D-Pad. Both of these features get a "pass" in my book, but I think touchscreen game controls still have a long way to go on Android. So far, ShadowGun's blows away the competition in terms of controls and mechanics. 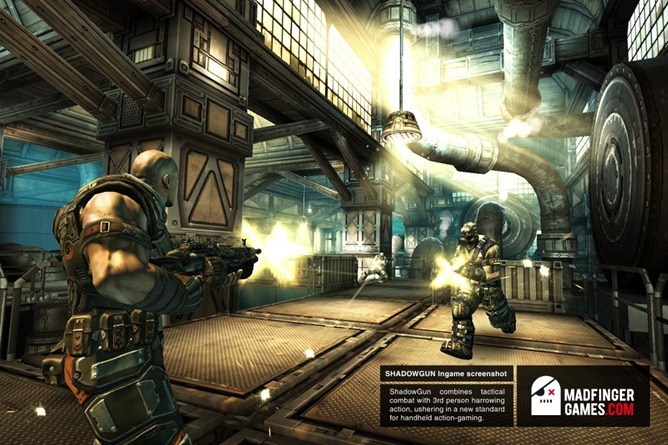 If you were to judge ShadowGun against any other Android shooter, it's no contest. It just needs a few tweaks to be truly great on its own merits - which we'll discuss in the game's full review, very soon. We'll get the story out of the way quickly: it doesn't matter. You're some badass space marine for hire on a planet overrun with mutated humans, trying to track down the bastards responsible so you can get paid by your corporate handlers. I'm sure it'd make a great Dwayne Johnson movie. There's also puzzles: "hacking terminals" test your memory by playing a series of numbers on a keypad which you must then re-enter in the correct order. Fail, and you'll alert the guards that you're up to no good. Simple "find the switch" puzzles are thrown in as well, but I think they actually detract from the gameplay by breaking up the action flow too obviously. Long corridors and ambience can achieve the same "downtime" effect with less annoyance to the player. As for depth of gameplay, we don't know how long ShadowGun is, or how difficult it gets - our preview build only went up to level three. That took about 45 minutes with about a half-dozen deaths. The preview also only included three guns (an SMG, a shotgun, and a grenade launcher), so you can expect a number more in the official release. I think we can confidently say that ShadowGun is a look into the future of Android gaming. But the game does have its problems, which I'll discuss fully in my actual review (soon!). ShadowGun as a platform is fantastic, but I'll need to play the full game to make a well-informed judgment on just how good a game it really is. 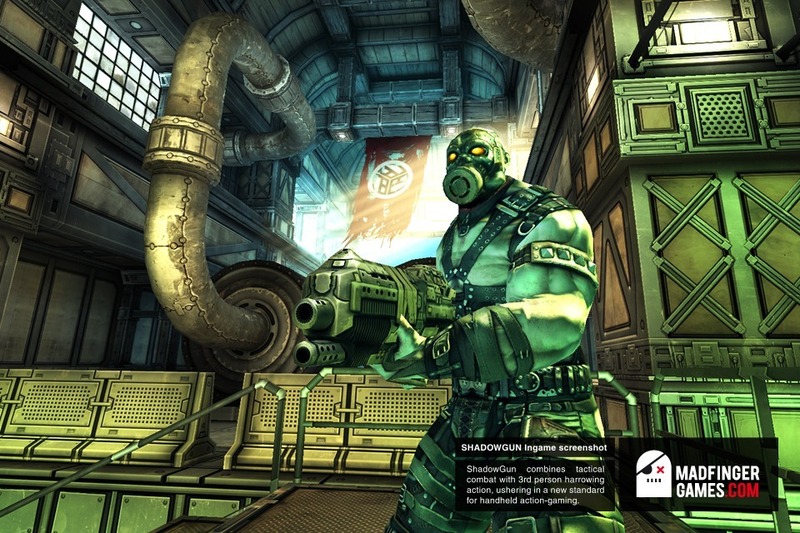 ShadowGun will be coming to the NVIDIA Tegra Zone this month, and on the Android Market shortly thereafter. We have not received information about pricing. Update: The price is set at $4.99.